Which of your Prospects is most likely to invest in your fund? Now you can find out in a glance. Behavioral Data: The future of Hedge Fund Marketing. We have all the data, how can we use it in the most efficient way? Is there a way to know who is a ‘hot’ prospect? 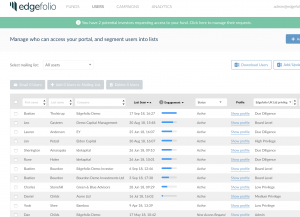 I have more than 2000 Investors in my database, how can I prioritize? If I had time to focus only on 2 prospects, who should they be? Presenting: Engagement level of your prospects! The aggregated system weighs users’ activity against each other to make it easy for managers to identify their top investor prospects. Managers are now equipped with a better level of understanding of who to focus their time on, rather than chasing loose ends, making their fundraising less stressful. No more guesses or lost time on bad leads. Focus only on what matters. This is what happens when technology and behavioral analytics get to work together! Why don’t you book a meeting to see how this looks like? We hope you enjoy these new features and fixes! Our clients are also our partners. We take the feedback we receive very seriously, and we plan our next features according to our clients’ biggest needs.